A few weeks ago my 01/W started sounding „hissy“ and distorted and the output level dropped audibly. After a short power off it recovered without further action. But then, on the next day, all analog outputs were dead. 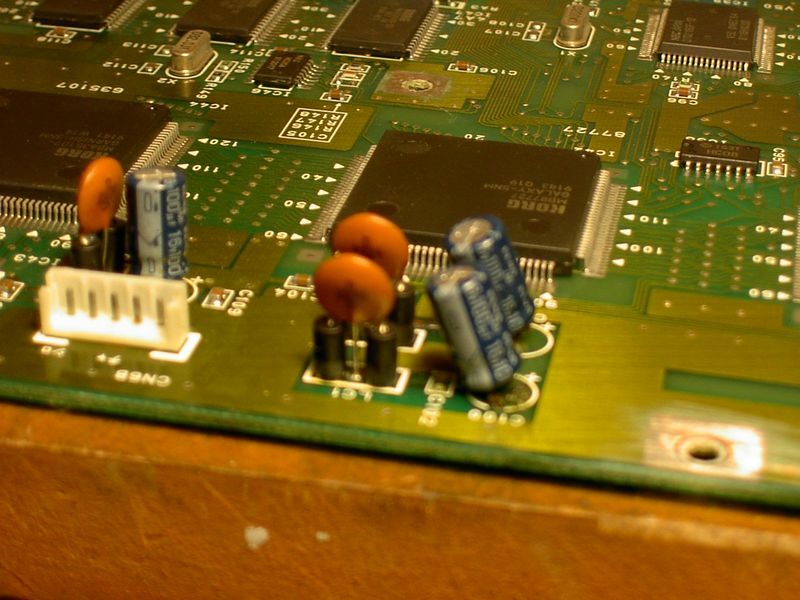 When I opened the housing I found two leaked electrolytic capacitors on the mainboard’s sub-PSU for the DAC and analog stages. 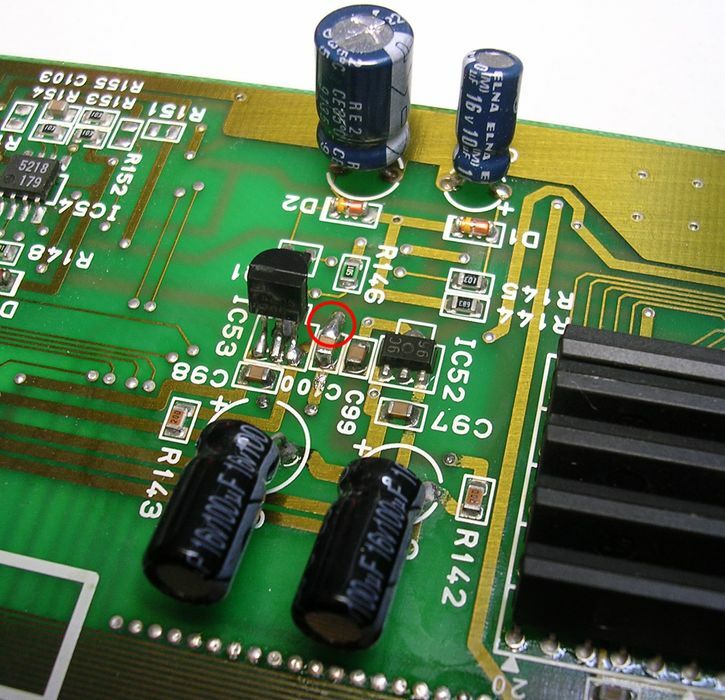 This ±5 volts sub-PSU with two 100 mA voltage regulators is disposed behind the ±12 volts stabilisation circuitry of the main PSU and supplies stable and noise-free local voltages. 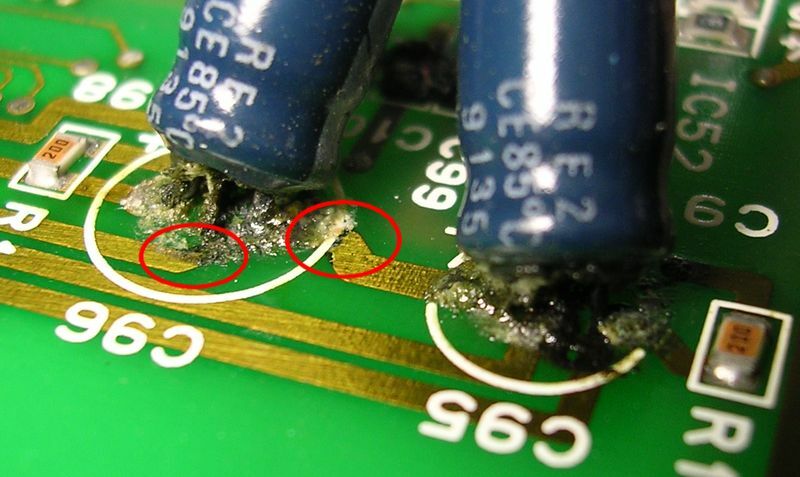 The caps C95 and C96 had ruptured and the sub-PSU and even more distant parts were spattered with electrolyt. 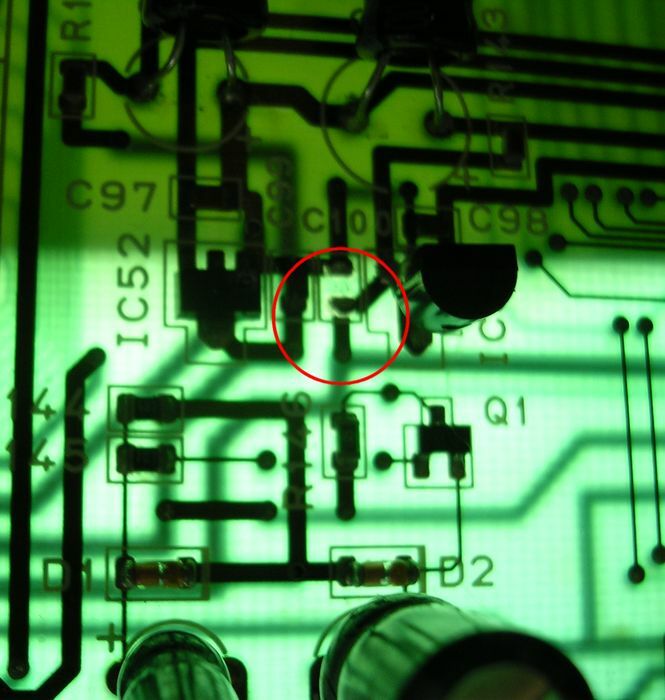 And the really bad thing about leaked electrolyt on a printed circuit board is that it causes corrosion and damage of metallic parts and circuit traces. 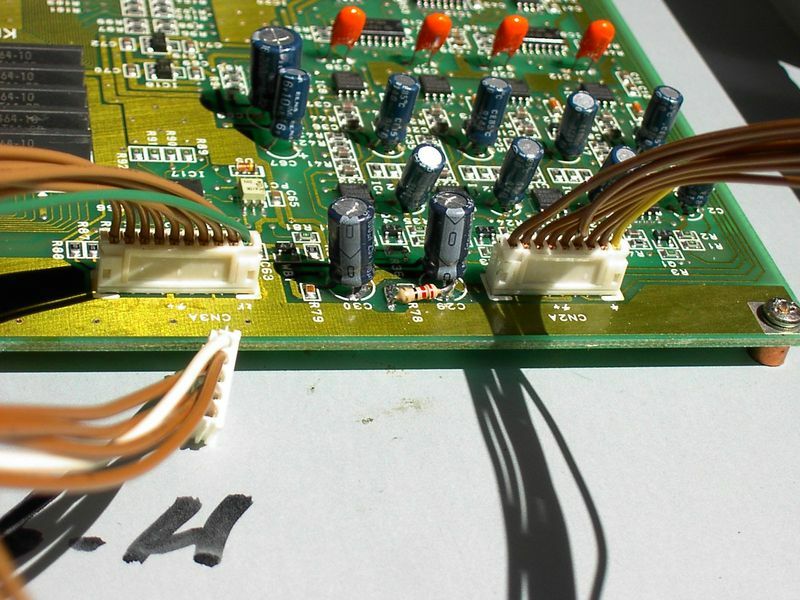 See the „overgrown“ capacitor C100 or the diode D3 on the photos for an impression of how this affects and proceeds. To clean this type of mess I prefer cotton swabs heavily soaked with isopropanol (isopropyl alcohol). 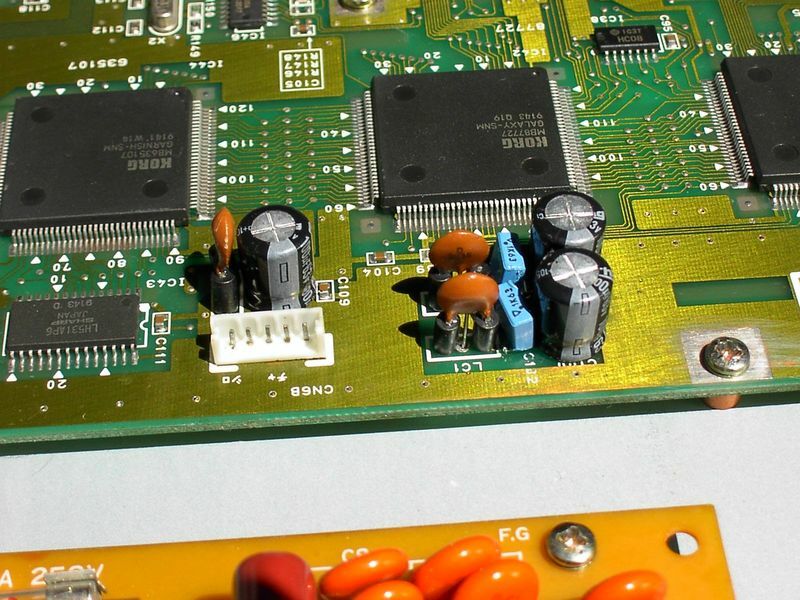 There’s no need to spare with the isopropanol, it does not do any harm to electronic components and evaporates without residue. And the cleaning should be repeated a few times with fresh swabs. What has been left over from the „acid attack“ on my 01/W did not look dramatic at first. 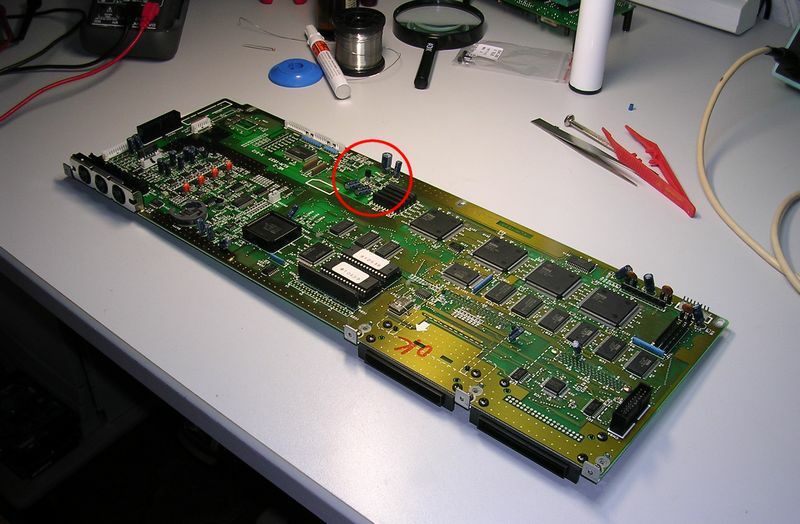 I replaced the two evil caps, connected the mainboard and powered up the 01/W, but there was no sound. 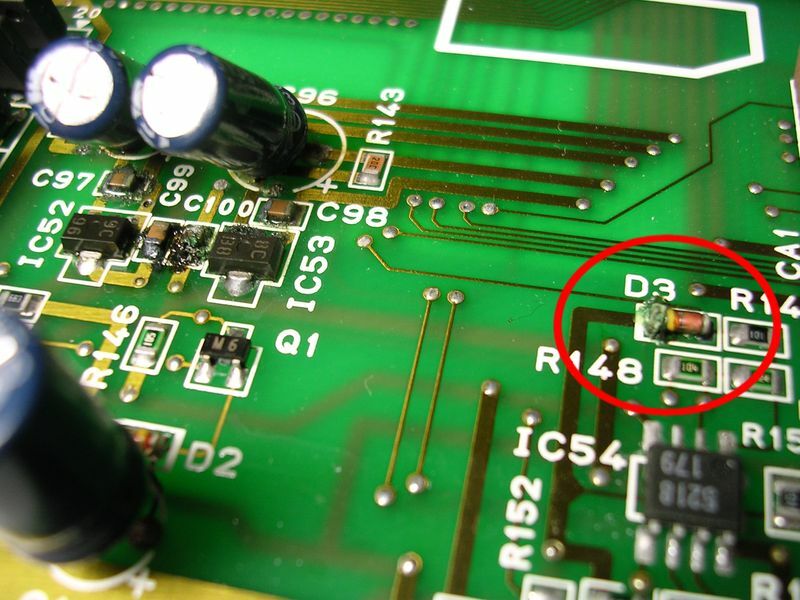 While measuring I found that the negative leg around the IC52 (79L05) was operational but IC53 (78L05) floated around at 0 volts on it’s output and input. 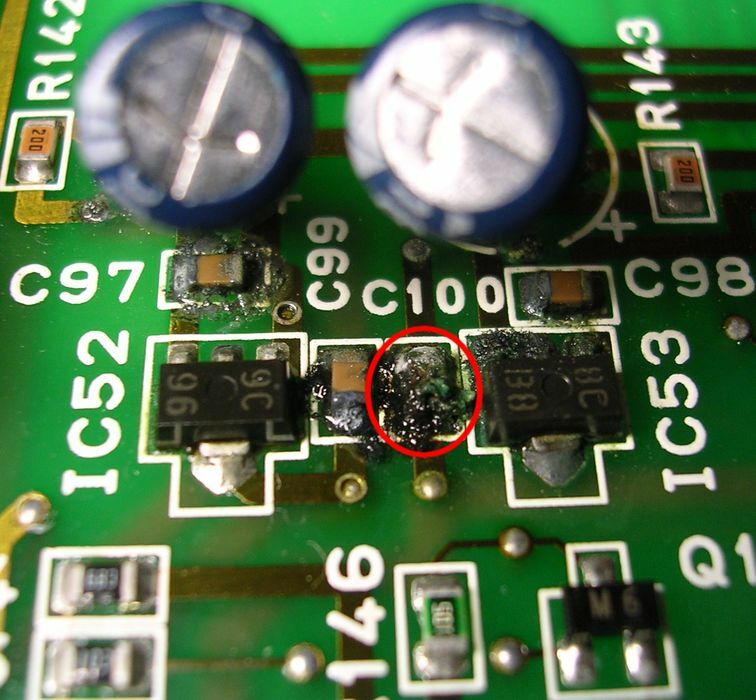 Then I noticed that one of the C100 capacitor’s leads had been „eaten“ by the acid and — more important — the +12 volt trace below the lead had also been etched away. 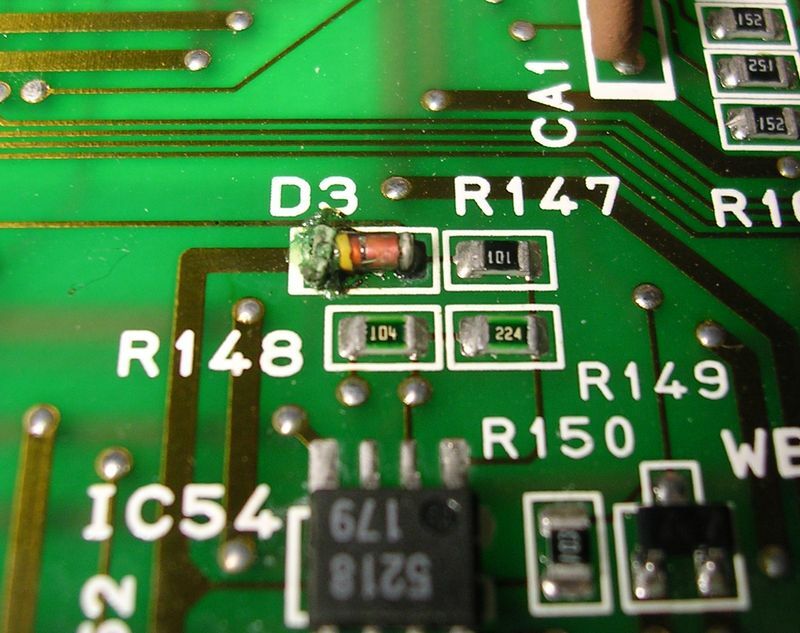 So I replaced C100 and patched the broken trace by scraping off a bit of solder resist and bridging it with solder. 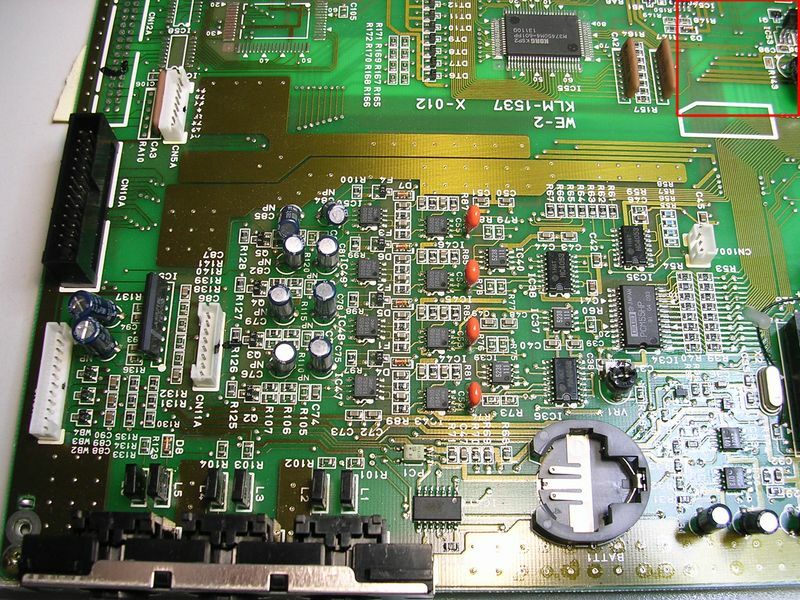 As you can see on the photos I also replaced IC53, which stabilised at 4.5 volts and not 5.0 volts. 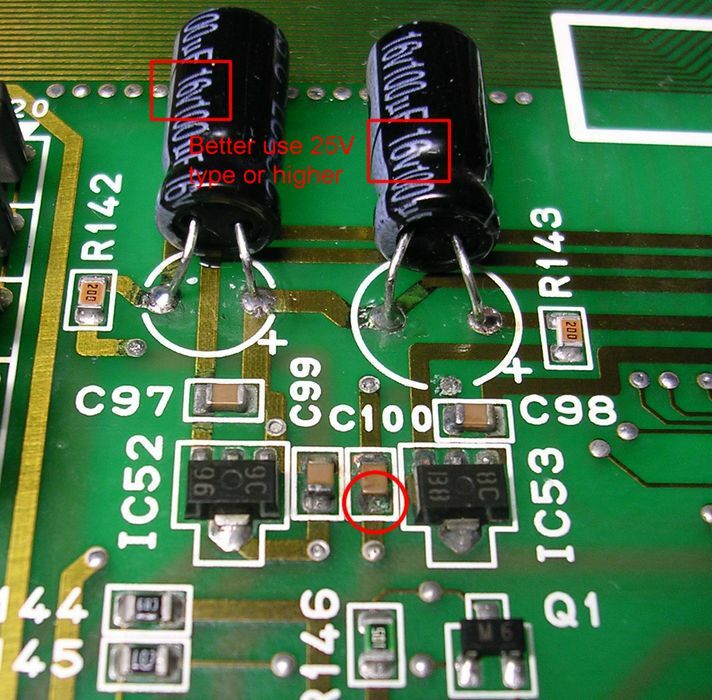 Of course, it is not state of the art to replace an SOT89 SMD component with a TO92 through-hole component, but firstly it would have taken some amount of effort to get the SOT89 variant and secondly it is yet a robust and well-functioning replacement in this case (fitting pinout and leads, no thermal or mechanical aspects to be considered). 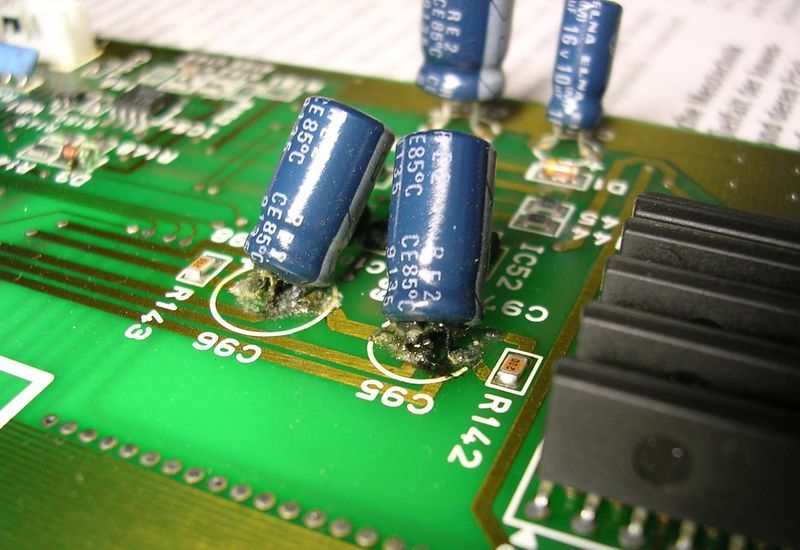 The other capacitors on my 01/W were apparently in a good condition, so I would not estimate this to be a general case of „bad-caps-alert“ for all the other 01/Ws around. 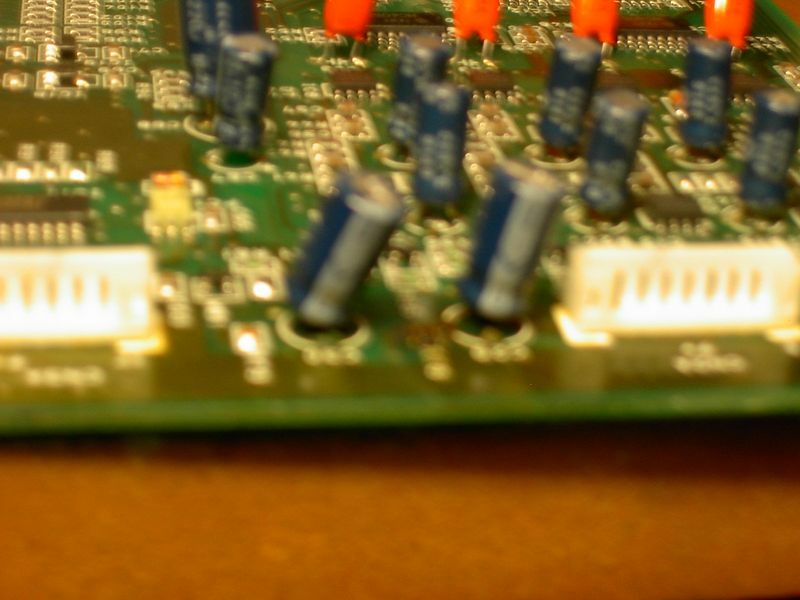 However, in the recent past I read about 01/W owners on the net who have asked for advice on their whatever natured „no sound“ problem, and so this article may give you a hint towards the possible cause. You are currently browsing the Hajo's weblog archives for August, 2008.